These experiments, called PROJECT SEA HUNT, used three pigeons a small observation bubble on the underside of a helicopter. The birds faced 120 degrees from each other so that they covered the entire 360 degrees under the aircraft. 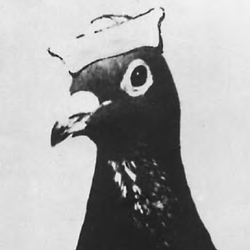 The pigeons were trained to recognize objects floating in the water and communicate with the helicopter pilots by pecking a key that would help guide the pilots to the targets. The pigeons were 93 percent accurate at locating objects floating at sea and their false positive rates were extremely low. Human flight crews were accurate 38 percent of the time. When combined with human searchers, the pigeons' success rate was nearly perfect. Also, unlike humans, the pigeons did not get bored as Simmons had trained them to respond even when there were hours between sightings. Eventually, the Coast Guard recognized the value of Simmons' pigeons and called this project "the best daylight search system" yet developed. Why isn't this in use today? Lack of funding. Click here to read an old article about Project Sea Hunt.